now your portable disk can be removed safely. Note: if you're using kernel newer than 2.6.32, there would be an error line 180: echo: write error: Invalid argument, change that script on line 180 from suspend into auto. 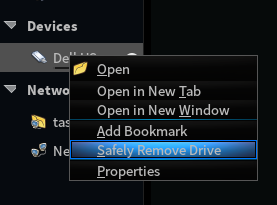 And of course if you have Nemo (or maybe Nautilus too, but not for Thunar) installed you can always right click and then safely remove the drive without command line.